MusicRiot favourites and early “MusicRiot Presents.. ” podcast featured band Flamboyant Bella are continuing their inevitable journey to the big time with a headline gig at London’s Islington Academy. The gig on 19th February is being helped to be promoted by FB’s fanbase who are able to get free tickets by demonstrating how they have spread the word about the gig. Check out Flamboyant Bella’s website for full details, or just get some tickets to the gig. It’s the sixth MusicRiot Presents podcast – and we’ve got a couple more great artists. Kill Cassidy join us on the MusicRiot Presents podcast episode 6, and here they give us a bit of background type info! Tim: My name is Tim Sensation, I have my parents to thank for that. I sing in Kill Cassidy and am half of the song-writing team. Jess Morgan entrances us on MusicRiot Presents… podcast episode 6, and so we thought it was a good idea to find a bit more about the woman behind the voice. Now let me see… I was born and grew up in Norfolk. I’m a huge fan of the countryside and the coast which Is why i suppose, things didnt work out so well for me in London this year. I moved to the big city after graduating to try to gig as much as possible and make a name for myself. I did play a lot of gigs and think it came to about 60 gigs from October to October. I’m a hard worker and I’m always writing wherever I go. I’ve moved back to Norwich now and intend to try to build a solid following of likeminded people whilst still keeping links with London and other regions. As we are fast approaching the launch of MusicRiot favourite Cassette Electrik’s latest single, we are jumping over to their official blog to find out more about the song, the gig prep, and many other things. Here is the first entry. Instead 28 Days was written about one of those times when the actions you would like to take are, for one reason or another, not possible and as such passions build up all the more so for it. I’m coming to realise that quite a few of my songs seem to be about moment such as these – time of stasis (if I’m going to sound pretentious I may as well do it properly) when everything and nothing is possible, when possibilities are hanging in the air just out of reach and you have a feeling that if you don’t act to make something happen, the moment will probably disappear. Cassette Electrik single launch gig spectacular! 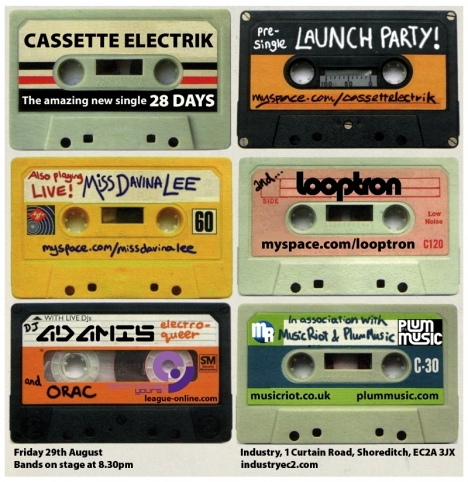 Cassette Electrik were our very first featured artist on the “MusicRiot Presents…” podcast, and we are happy to once again be involved in bringing you a special gig as they launch their new single “28 days”. Buy your ticket right now! We are going to be bringing lots more Cassette Electrik goodies in the coming days, including a review of the single, and a live review of the gig for those of you who can’t get along so you can read about what you missed, you silly, silly people!